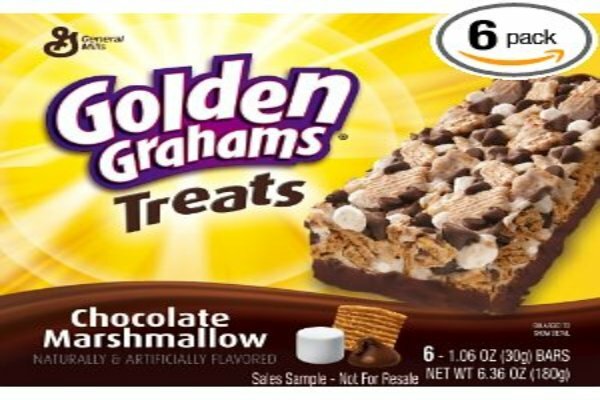 It’s safe to say that a few years ago I became addicted to the luscious Golden Graham treats shown in the photo above. They were sold at the convenience stores on my campus and in the Student Union Building, and it seemed that whenever they caught my eye, I couldn’t help but drop a couple bucks to fulfill my craving. I always found a way to justify the purchase: late night studying, an extra hard work out earlier, or even, hey, I’m not consuming those calories from beer tonight, might as well replace them with this! Eventually, I weaned myself off the addiction, avoiding the “packed sweet snacks” area in all stores, and I had almost forgotten all about them…almost. Recently when trying to decide on a homemade treat to bring somewhere, I recalled my Golden Graham treat addiction and searched for a recipe to make at home. What I found was Baked Bree’s recipe for smore bars, and they are to die for. Since finding the recipe, I have made six batches of these bars, and every group of people that has been lucky enough to taste them has raved for weeks. The packaged treats are undoubtedly finished for me, and while I’m quite sure this new snack isn’t much healthier for you, it certainly is delightful. Shannon Kelley is finishing her Master’s degree in Education by student teaching in St. Louis, Missouri. She gained major bonus points with her students for bringing these treats into school. Crush the golden grahams in the bag. Melt butter in a large pot on the stove or in the microwave. Add the mini-marshmallows and continue heating until fully melted. Quickly add in the golden grahams and a portion of the chocolate chips (how ever much you would like to be in the bars themselves). You want to do this part as quickly as possible before the mixture gets too sticky and hard to work with! Spread the mixture into a greased 9×13 pan and pat down, sprinkling the remaining chocolate chips on top. When completely cooled, cut into bars and serve!